Once upon a time, there was a country named Soviet Union. It was known, among other things, for its adoration of the great Vladimir Ilyich Lenin; its peculiar conception of art, known as socialist realism, and its insistence on making such art omnipresent in the lives of its citizens; its obsession with WW2 and its slightly distorted historical recollection of the events; and its incredible ability to convince its neighbors, near and far, of the superiority of its political regime, communism. Among those ardent believers in the October Revolution was Tajikistan, and Soviet Union was eager to bring to its Central Asian brothers the latest advances in living conditions, education, agriculture, and industry. As a token of their unconditional love for Marxism-Leninism, Tajiks embraced the Soviet values. The capital, Dushanbe, became Stalinabad (until Stalin’s cult of personality was no longer in fashion, that is). Khujand, the country’s second largest city, was renamed Leninabad (bad meaning city, not “bad” in the English sense). This is the town we’re visiting today. In Khujand as elsewhere, monuments were erected in the socialist realist style, particularly the inevitable Soviet mosaics and reliefs on roadsides. Soviets didn’t seem to see much difference between Georgians and Tajiks. Just like the former in the first post of my Georgian Adventures, all the latter seem to do in artistic depictions is sit, play music, perform theatrical plays, and pick grapes (believe it or not, the country makes wine). In other words, no honest socialist work — just compare them to the various monuments to the Worker and Kolkhoz Woman in the rest of the Empire here and here. Leninabad celebrated its eponym with several major landmarks. An imposing statue of Lenin was prominently placed in the city center, relocated from Moscow in 1974. Hotel Leninabad flew the colors of communism to visiting neighbors and the odd tourist. And to this day, the whole city is crossed by 10-km-long Lenin Street, along which one finds most of the city’s points of interest. The obligatory WW2 monument is there too. It’s just off Lenin Street on Victory Square, naturally. Tajiks were conscripted into the Soviet Army, and about 5% of the country’s population was killed during the war. Finally, the inconceivable happened: Soviet Union collapsed. I’ve already narrated this dark period of the Tajik nation’s history in my previous post. Many of the structures created by the communist regime, both buildings and organizations, were no longer needed and ceased to exist. Lenin was the first to be hit — capitalism made him useless. Many former republics felt the need to find a symbolic replacement, both figuratively and literally, and in Tajikistan this successor is Ismail Somoni. Somoni was a ruler of the Persian Samanid dynasty in the late-9th and early-10th centuries, a prosperous period that marked the birth of modern Tajikistan. So quite logically, the father of Tajikistan replaced the father of Soviet Union in the historical narrative. The literal aspect took a bit longer: many of those Soviet statues weren’t easy to dislodge, plus they still had their fans (you know the type: veterans with so many medals that could barely fit ’em all on their uniforms). And a square with an empty pedestal looks bleaker than one with a 12-meter-tall Vladimir Ilyich. 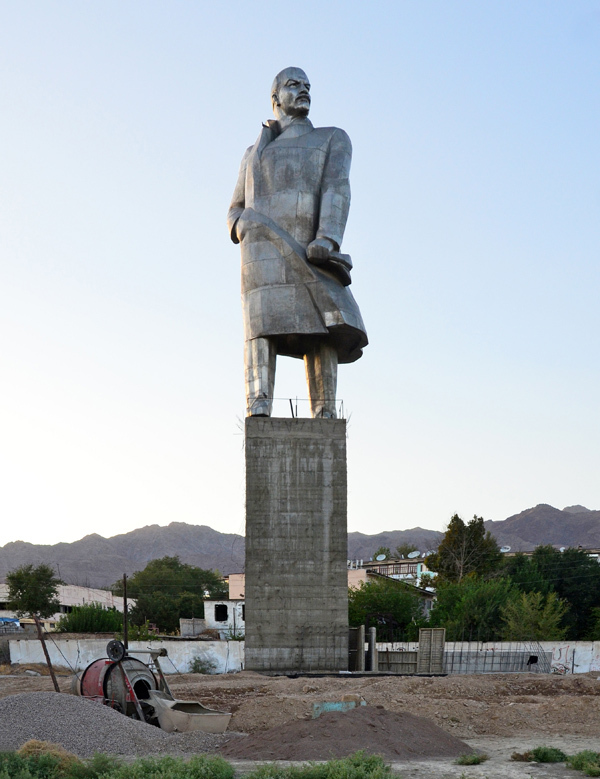 But eventually, in 2011, Lenin’s statue was dumped into a remote suburb, in the middle of a moribund park with a second-class war memorial, and replaced with a shiny new monument to Somoni. 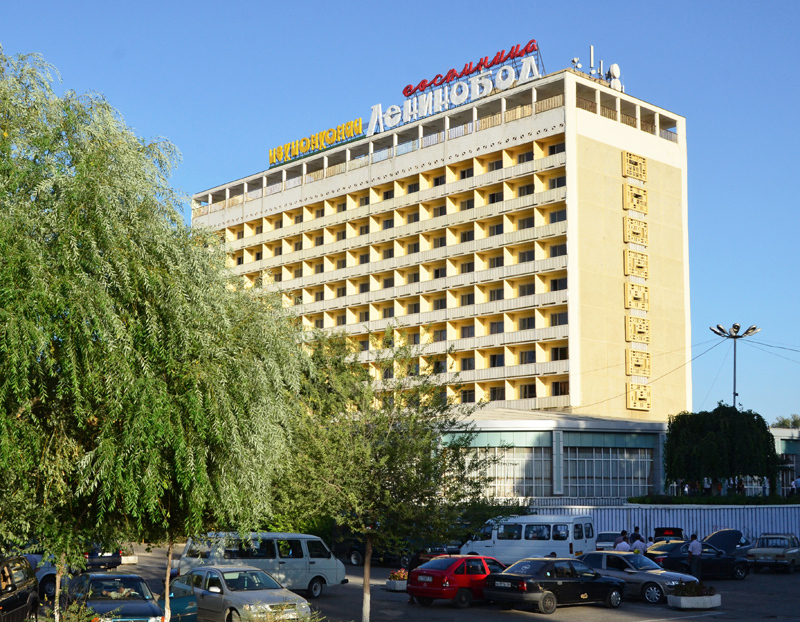 Hotel Leninabad’s fate isn’t much more enviable. In a market economy, it became painfully clear that there wouldn’t be nearly enough tourists to fill 8 floors of rooms of rudimentary comfort in the foreseeable future, and so management operates only 2 floors (still a very optimistic decision). This has rendered the elevators obsolete, which is probably a good thing, as nobody wants to get trapped in a Soviet elevator in Tajikistan. And this in turn has allowed the reclamation of space for potted plants as well as the only post-Soviet appliance in the whole hotel: what The West calls a Refrigerated Glass Door Beverage Merchandiser (Tajiks call it a fridge, and it doesn’t always work). Other than that, the decor has barely evolved since 1990 — even the light bulbs haven’t been changed. This gives the whole place a feel of abandonment, shared in fact by many streets, parks and neighborhoods outside of the lively city center. With less than 200,000 inhabitants, Khujand (sometimes spelled Khojand) isn’t exactly large. Founded in the 6th century BC and once a major stop and cultural hub on the Silk Road, the city was conquered by Mongols, annexed by various Central Asian khanates, and then became a part of the Russian Governorate of Turkestan, before it was incorporated into the Soviet Republic of Tajikistan. For the tourist, it’s a good stopover when coming from Tashkent, Uzbekistan, before exploring the rest of Tajikistan (even if the border crossing can be epic). You’ll get your first taste of Soviet relics even as you’re entering town. 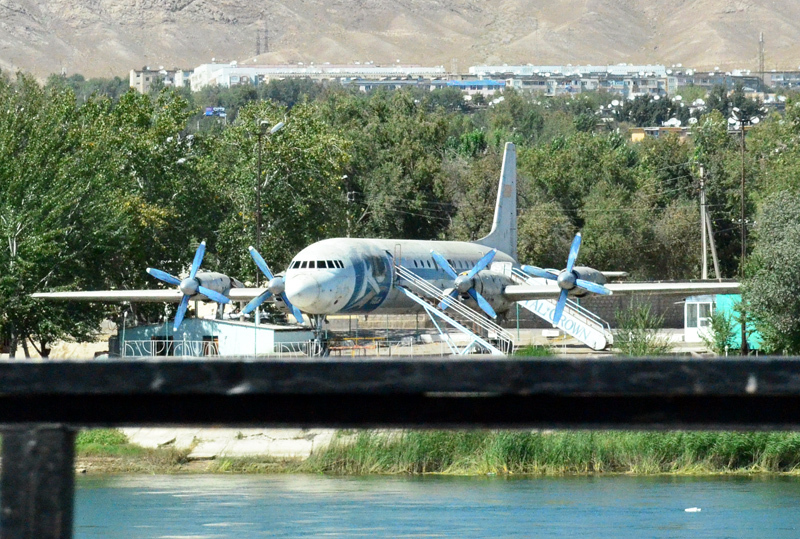 Crossing the Syr-Darya river on Gagarin Street, you’ll see an old propeller jet which was supposedly once turned into a café but is now closed. At least I think it’s closed, as I don’t see it mentioned anywhere. Maybe it’s just flying under the radar? Ba-Dum-CH! And speaking of cafés, it’s about time we talk about food! Tajikistan shares many dishes with Uzbekistan, with slight regional variations: plov (usually called osh), manty, shurpa (shurbo in Tajik) and non are often on the menu. There are a few typically Tajik dishes, like the qurutob I’ve already talked about. 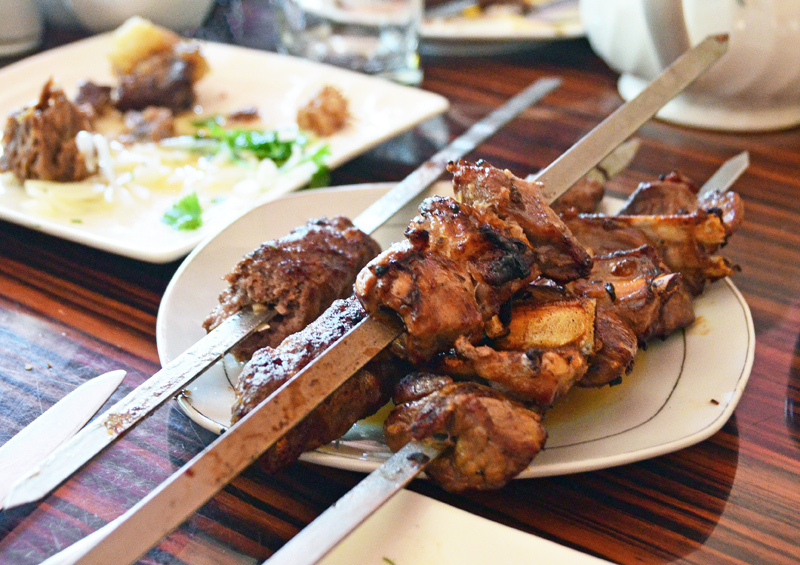 And then there are lots of kebabs, which in Khujand must be tried at Café Ravshan. According to Lonely Planet, at least. TripAdvisor has a dozen more options that don’t strike me as any less appealing. But hey, if you have a Mercedes, this is the place to go to. In a country where restaurants are still more like places where you go to avoid cooking your own meal rather than temples of gastronomy, kebabs hold the upper hand. Everybody loves them, they’re easy to make, there’s no complicated cooking or intricate utensil required. Man love meat. Man love play with fire. Man wash no dishes. Man love kebab. 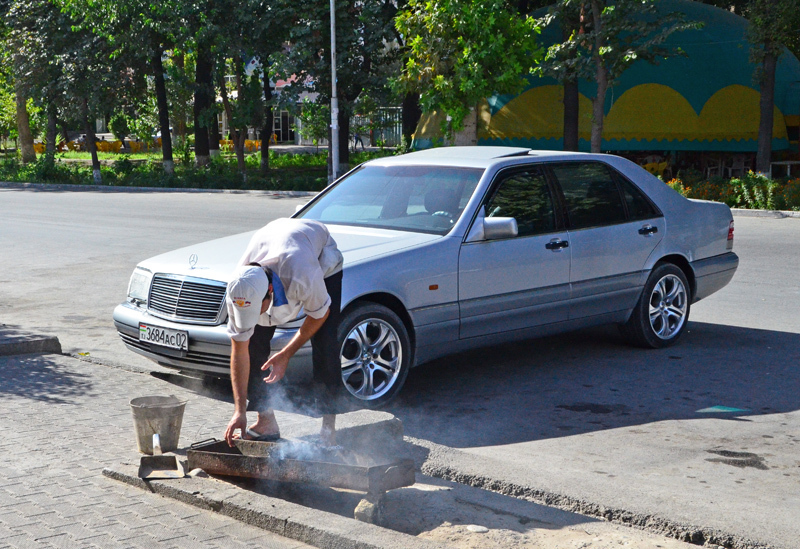 Again, the skewers aren’t very different from what you encounter in Uzbekistan (which is one of the best places for great kebabs). Expect chunks of chicken or lamb, and lyulya-kebab. Add to that a salad of sliced tomatoes, cucumbers and onions (called shakarob), some flatbread, and you’ve got the traveler’s typical Tajik meal. As in most of Central Asia, lamb is king. When it’s not served as kebabs, it’s minced in manty, cooked in shurpa and plov, or simply boiled, like in the simple dish below, whose name I’ve unfortunately forgotten. 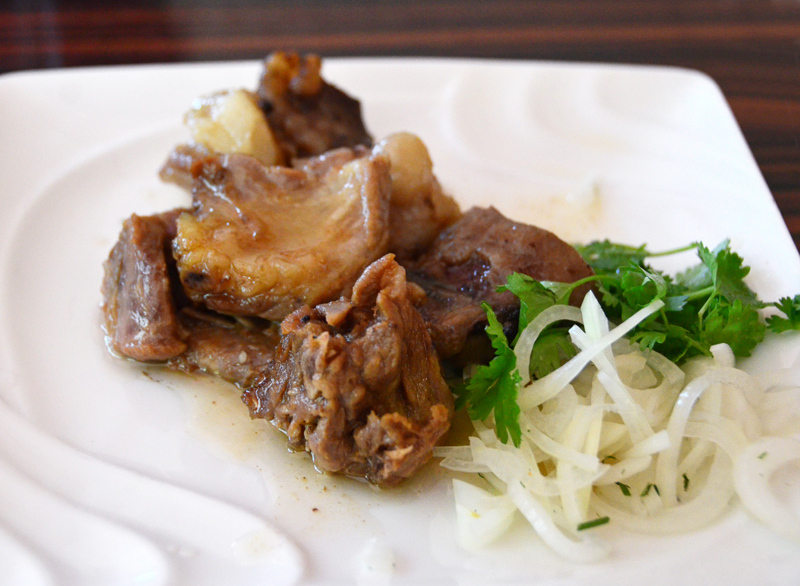 Just look up how to say “boiled lamb with onion” in Tajik, I guess. There’s more, but you’ll have to wait. Next time, we’ll visit Khujand’s Panjshanbe Market.